Also, available in wave and perforated cutting styles. When it is time to change the blade on the Swingline SmartCut Lite and Pro Series Rotary Trimmers or the GBC SmartCut A300, A400pro, and A410pro rotary trimmers, use the SmartCut Straight Blade for Lite and Pro Series. For precise clean cuts, regularly replace the cutting blade. Cutting Length: 12" or 15"
Great price, shipped quickly, easy online order. I would order again. Transcript: Welcome to MyBinding.com. These are the SmartCut Pro Straight Cutting Replacement Blades from Swingline. Welcome to MyBinding.com. 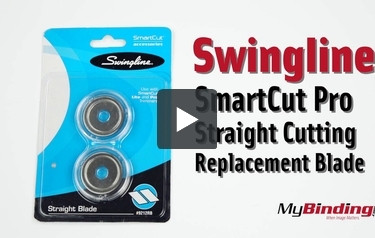 These are the SmartCut Pro Straight Cutting Replacement Blades from Swingline. If you’re not getting perfect results from your SmartCut Pro rotary trimmer, it’s probably time to replace your blade. Start by removing the grey side cap from the blade housing, then remove the small nut holding the blade in place. The magnetic blade holder should come right off the bolt still holding the blade. Place your new blade against the magnet and fit back onto the bolt. You may need to twist the holder a little to get the blade over the hex washer. Tighten the nut, replace the cap and you’re ready to cut again. Is this 9212RB compatible with the Quartet models? Thank you for your question. The Swingline SmartCut Pro Straight Cutting Blades are only compatible with the Swingline SmartCut Lite and Pro Series Rotary Trimmers or the GBC SmartCut A300, A400pro, and A410pro rotary trimmers. Thank you for your question. The Swingline SmartCut Pro Straight Cutting Blade (9212RB) is compatible with the Swingline SmartCut Lite, Pro Series Rotary Trimmers and the GBC SmartCut A300, A400pro, and A410pro rotary trimmers. Is this item compatable with model 9624? What is the diameter of the 6-sided hole in the middle of this blade, 9212RB? Thank you for your question. The over all diameter of the blade for Swingline SmartCut Pro Straight Cutting Blade ( 9212RB ) and hexagon hole in the middle is 5/16" across. What is the diameter of this blade, 9212RB?